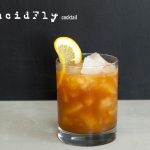 lucidfly.com | Let’s Make a Toast to The Lucid Fly Cocktail! Thirsty? Well, check this out…..
Our friends over at The Drink Blog helped us create a signature Lucid Fly cocktail (& mocktail) for our CD Listening Party…in celebration of our new album “Building Castles In Air” – releasing this Friday, November 11, 2016. Now that we had a solid base of Tang (epic!) and bourbon, I wanted to play with their album Building Castles in Airand the first single, “Visions of Grandeur.” Those both have dreaming, imagination and vision in common. The tool to help? Absinthe.